Rio Grande’s waste water treatment plant was flooded early in the morning on July 14. Crews are working around the clock to get the facility fully operational again. RIO GRANDE — High flood waters from a series of thunderstorms over the week have threatened Rio Grande’s sewage processing capabilities. The wastewater facility for Rio Grande was designed in the 1960s to prevent flooding to the facility with hills (dikes). 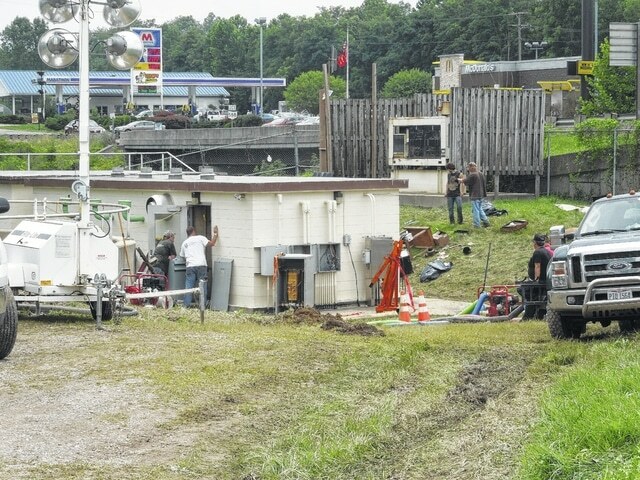 Gallia County Engineer Brett Boothe told the Tribune earlier in the week the latest storms had caused some of the most extensive water damage he had seen in the area. Perry said there was water up to the roof of one of the main control buildings in the wastewater facility during the early morning flood. She said when she arrived at the facility at 6:30 a.m., water had receded to the top of the building’s door. She said one of Rio Grande’s fire trucks arrived to help pump water out of the property to aid in clearing a way to the control building. Ohio Department of Natural Resources brought in equipment as well to aid in the water removal. The village also rented a pump from Bridgeport to help in water removal. Perry said the Rio Grande wastewater plant receives sewage from the Centerville area. Rio Grande Mayor Matt Easter asks people in the community to “remain patient and conservative with water usage” until the plant is operational again. Perry noted the community is asking everyone to conserve usage because the facility is still pumping “raw sewage to an affluent.” She said that is not typical practice as the sewage needs treatment, but power constraints on the facility made proper treatment difficult and the community still needed to function. Ohio Environmental Protection Agency was notified by Rio Grande officials of the situation and arrived on site Wednesday to help advise. Gallia County EMA has also lent informational assistance to the Rio Grande community in the emergency time period. Easter said “folks are working 24/7 on the problem” and that he had good “vibes” the facility would be fully operational again soon.